The Bicycle Helmet Safety Institute submitted samples of six helmet models to a leading U.S. test lab: three in the $150+ range and three under $20. The impact test results were virtually identical. There were very few differences in performance among the helmets. Our conclusion: when you pay more for a helmet you may get an easier fit, more vents and snazzier graphics. But the basic impact protection of the cheap helmets we tested equaled the expensive ones. The results are a testimony to the effectiveness of our legally-required CPSC helmet standard. Although our sample was small, the testing indicates that the consumer can shop for a bicycle helmet in the US market without undue concern about the impact performance of the various models on sale, whatever the price level. The most important advice is to find a helmet that fits you well so that it will be positioned correctly when you hit. We have a page up with details of the testing. CPSC has granted a one year delay of enforcement of some of its new testing and certification requirements for lead, phthalates and toy standard compliance. Manufacturers and importers still have to meet the requirements...but do not have to have test records and issue certificates of compliance. There is no delay for lead paint and surface coating requirements, and no change in the requirements of the CPSC bicycle helmet standard. The delay gives CPSC time to work out new rules that could eliminate lead test requirements for some materials and products, and to issue more guidance on when testing is required and how it is to be conducted. Manufacturers and importers had been asking for that. There may eventually be some permanent relief for helmet manufacturers from some of the requirements, although savvy manufacturers and importers have already eliminated lead and phthalates from their products regardless of the CPSC requirements to meet regulations in California and other states, and for basic corporate responsibility reasons. Here is the CPSC announcement. NHTSA has released their assessments of deaths and injuries on the roads in 2005. It is disheartening to see that cyclists' deaths have risen from 727 in 2004 to 784 in 2005, an increase of 57, or almost 8%. Even worse, the two year increase is 26%. The 2005 numbers represent the highest level of cycling fatalities since 1997. Ninety-two percent of the cyclists were hit by a car. Deaths were much higher--over 900 per year--in the 1980's before local jurisdictions began comprehensive efforts to upgrade bicycle facilities, before bicycle rider education efforts were introduced and before widespread helmet use, but the rise this year and last tells us that there is much more to be done. Helmets are an essential part of that, and should never be overlooked as one element of a comprehensive safety campaign to save bicyclists' lives. We have some of the just-released numbers on our Statistics Page. We are always encouraged by a new Consumer Reports article, since they provide the only publicly available data on helmet effectiveness by brand. We have a review of their article up and were very pleased that they have made the full results available for free on their Web site. We only wish they were able to test more of the lower-cost helmets that we believe are probably more effective than the most expensive models. The British Medical Association examined the evidence and recommended in 2004 that the UK adopt a mandatory helmet law for both children and adults. Their study is available on the BMA Web site. They had previously recognized the benefits of helmet use but had feared that a helmet law might reduce cycling. Following that BMA finding a small group of anti-helmet law Brits have become increasingly strident in their opposition, posting messages on various Internet sites. A look at the BMA study shows the opponents' "science" to be flawed at best. We have posted an article from Bicycle Retailer and Industry News about Bell Sports search for a new owner. Although any news about the industry's largest manufacturer is of interest, the significance for consumers as Bell has been sold and resold in the past has been minimal. The counts of helmets and unhelmeted riders that local Safe Kids coalitions have been working on for some months will be tabulated and ready for a big announcement on May 11th. Bell Sports, who funded the study, has lined up Lance Armstrong's mother to make the announcement. This will be a significant new piece of data, since it represents the only national helmet use survey ever attempted using actual head counts, and should be a considerably more accurate than other methods. Two new studies have appeared in medical journals in October that may enable a new approach to helmet standards. One in the journal Neurosurgery. It is the first article reporting on ongoing research to pinpoint both the level of impact and the injury mechanisms involved in concussing football players. It is beginning to establish the impact threshold of concussions, a long-debated parameter that holds back the development of better anti-concussion helmets. You can read the abstract on the Neurosurgery Web page. An excellent article on the study appeared in the November 7, 2003 Washington Post. More data should be available soon from another study of football players at Virginia Tech, where helmets have been instrumented to provide impact readings during games. Here is the abstract from a later Neurosurgery article, and a search on their Web site. The second study was performed at Wayne State University, and has been reported at an October conference of IRCOBI, the International Research Council on the Biomechanics of Impact. It used new techniques to track targets within impacted cadaver heads to establish the dynamics of the brain's reaction to impacts. There is no substitute in this case for seeing the presentation of results, since the movement of the reference points shows an amazing and non-uniform movement of brain parts. This research is a start in a new direction for understanding how brains are injured. Both the these studies are major advances in understanding the injury mechanisms that helmets must prevent, and should lead to better helmets and better helmet standards in coming years. A study by pediatricians in Falmouth, Massachusetts, tested the ability of kids and parents to fit bicycle helmets. It concluded that most did not fit them well. In fact, the results were dismal, with only 4 per cent passing the study's standards for fit and condition. Even if you find some of their criteria too stringent, a full 80 per cent failed the basic stability part of the assessment, a one inch movement front to back and side to side. That corresponds to what we hear from the field from bike rodeo fitters and others who deal with kids who come to events with badly fitted helmets or helmets in poor condition. Fit is indeed a problem for all ages, not just for kids. Utimately the responsibility for helmets that are too hard to fit rests with the manufacturer, since 80 per cent or more of the users can't be wrong! For more analysis see our page on the study. King County in Washington State has long had a bike helmet law, but it did not cover the City of Seattle. Following a resolution of the Seattle City Council in June, the Board of Health has now extended the law to cover the City as well. We have added the new info to our helmet laws page. In an article posted on their Web site on July 16th, ANSI has for the first time acknowledged publicly that their bicycle helmet standards are now the ASTM bike helmet standards, referring to them as ANSI/ASTM standards. They are a few years behind, using the 1999 version of the ASTM F 1447 bicycle helmet standard, but that's a major improvement. We and other members of the old ANSI Z90 committee have been working for this day since we voted in the Z90 committee in Denver in 1995 to adopt the ASTM standard. In effect ASTM had taken over the field, and the ASTM standard was at the time the most-used bicycle helmet standard in the world. The old ANSI Z90.4-1984 standard had been withdrawn by ANSI, leaving many US state and local helmet laws still specifying that standard and therefore perhaps weakening them. The current acknowlegment of a joint standard may eliminate that problem. We called to order a copy of the standard from ANSI, asking for just "your bicycle helmet standard" and were referred to a member of the ANSI headgear committee "to make sure what standard you want." The contact advised us to obtain the standard from ASTM. But the principle has been established, and meeting "the ANSI standard" means meeting ASTM F1447, not ANSI Z90-1984. The Union Cycliste Internationale, Europe's pro cycling organization, has announced that it intends to require helmets for all riders in all races it sanctions. The ruling follows the death of Kazakh rider Andrei Kivilev. Kivilev died of a head injury without a helmet. The impetus for the ruling had grown due to other head injuries and deaths in races. In addition, a helmeted rider fell on a turn at an intersection in a rainy Dutch stage of the Tour de France and hit his head on a concrete bollard in the center of the road, but to the astonishment of the crowd got up and raced away. Press reports indicated that the team doctors supported the ruling. A attempt to impose a similar ruling in 1991 failed when the riders protested, ironically in the same race where Kivilev was killed 11 years later. Update posted May 31st: The peloton has been wearing helmets in UCI-sanctioned races all over Europe. Riders can be fined, lose UCI points or even be expelled for failure to do so. Helmets were the rule for most of the Giro d'Italia that ended today, but riders were permitted to jettison them for the final race to the summit on five particularly hard climbs. Signs marked where helmets could be tossed. A few riders kept their helmets on anyway, but the leaders did not, and Marco Pantani's bald pate was gloriously on display. The final stage had no hard climbs, so the final finish photos all included helmeted riders. Update posted July 17th: The UCI ruling is being observed by the Tour de France. With some major crashes in the first stages as well as on early downhills, those helmets are probably seeing some impacts. On May 15th CPSC staff is holding the first of several meetings on Recall Effectiveness with interested parties to discuss Motivating Consumers to Respond to Recalls. The meeting will be held at CPSC Headquarters in Bethesda, MD. You can read more or register at the CPSC Web site. Bike Magazine published a short review of four helmets in its April 2003 issue. The article covers the Bell X-Ray, Briko Twinner, Giro Xen and Specialized Telluride. Top marks for ventilation went to the Telluride, followed by the X-Ray, Xen and Twinner. The X-Ray scored highest for comfort, followed by the Telluride, Zen and Twinner. For retention, the marks were identical for all but the lower-rated X-Ray. All four helmets carry the CPSC sticker, with the manufacturer certifying that they meet the CPSC bicycle helmet standard for impact. Bike did not do any impact testing. You may be able to find the article on the Bike Magazine Web site. It is in the Gearhead section, and titled Head Shop. It is complete with photos of the helmets, prices, weights and an overall rating score. Kazakh bicycle racer Andrei Kivilev died on March 12th, one day after crashing near the French town of St-Etienne during the Paris-Nice road race. His team doctor, Jean-Jacques Menuet, was quoted in the press as believing that a helmet would probably have saved Kivilev's life. The most recent death in European pro cycling before Kivilev was Spain's Manuel Sanroma, who crashed in the 1999 Tour of Catalonia. Before that, many still remember the death of Fabio Casartelli in the 1995 Tour de France. As always, there is discussion of requiring European pro riders to wear a helmet as racers in the US are required to do. The Swiss-based International Cycling Union (UCI) has issued a statement noting that European riders rejected a mandatory helmet rule in 1991. Cycling News has a nice photo of the 29 year old Kivilev up on their Web page. Web accounts express sympathy for his wife Natalia and their six month old son. An International Conference on Closed Head Trauma: Traumatic Brain Injury (TBI) Mechanisms and Design Criteria for Effective Protection Strategies will be held January 27th to 30th, 2003 in San Juan, Puerto Rico. It is jointly sponsored by the U.S. Army and USDOT in cooperation with U.S. Consumer Product Safety Commission. Greg Rodgers of the Consumer Product Safety Commission staff has published an article in Injury Prevention on the effectiveness of State helmet laws. The article concludes that the laws have increased average helmet use probabilities by 18.4 per cent. You can read the study with all tables by registering on the Injury Prevention Online site. In its August 1 issue, Bicycle Retailer and Industry News reported that PTI, a major US helmet manufacturer in need of brand recognition, has licensed the Schwinn brand name for use on its helmets from the brand's current owner, Pacific Bicycles USA. PTI now sells through Target, Wal-Mart and other mass retailers. Their volume is probably among the top three or four in the US market. They have suffered from lack of brand recognition in competing with Bell, the market leader. In mid-2002 there are still some of the old production Schwinn helmets on the market at discount prices. We expect to see the new PTI-manufactured Schwinns in 2003. The French Government launched a bicycle helmet campaign on June 7th with a press blitz. Ads proclaim that each year in France 255 cyclists are killed and 6,250 are injured, and that 33 per cent of bike injuries are to the head. (Surprisingly, since only one of eight here is a head injury.) France has only 10 per cent of its riders using helmets at present. One of the campaign's ads seems truly strange to the American eye, featuring a cyclist and a motorcyclist arriving at a rack at the same time, bending over to chain up their mounts, and the motorcyclist's helmet bashing against the cyclist's bare head. She staggers back and stares helplessly at the unknowing motorcyclist as he walks away. The slogan is "Bikes and motorcycles have similar risks--shouldn't both wear helmets?" There must be a cultural thing here that we are just not getting if anyone thinks that ad would convert cyclists to helmet wearing. The National Safe Kids Campaign (now Safe Kids Worldwide) has announced on May 2, 2002, a new national helmet safety campaign. The campaign extends beyond bicycles to focus on all wheeled vehicles that kids ride: scooters, skateboards, inline skates and more. Here was (in 2002) a link to the Safe Kids press release on the new campaign. It had links to more info on their site, including a new study on kids' attitudes toward head injury while on wheels, new statistics, tip sheets, materials in Spanish and the details of their campaign. Although Safe Kids has been a consistent booster of helmet safety, this will be their most concerted effort in the field since their very successful campaign in 1989. Their local coalitions will be distributing to kids in need across the nation up to $1 million worth of Bell helmets donated by Johnson & Johnson and Bell Sports. That alone should ensure that this campaign has visible impact. In addition, Johnson & Johnson will be launching an advertising campaign that will include distribution of safety tips through 60,000 retail stores and to 45 million households across the nation. The Minnesota State Bicycle Advisory Committee, working with injury prevention specialists of the Minnesota Department of Health and the Twin Cities Bicycling Club has developed a Train the Trainer Helmet Workshop. The workshop teaches instructors how to run a class on selecting and fitting a helmet. There is no standard yet for testing the trainer on helmet fitting qualifications, but this workshop is an innovative approach to the problem of making sure those who distribute helmets can fit them well. We have put up the email they send out to publicize the workshop for details, or check the Web site above. The US Department of Transportation, National Highway Traffic Safety Administration, has released a new helmet video. The video is titled Ride Smart. We think it is the best free video anyone has produced for 8 to 12 year olds. Kids do the preaching. There are damaged helmets, an egg drop, a jello brain smash, good stuff on fit, and brief rules of the road. With credits and all it runs about 9 minutes. Free from DOT. Eventually you can get it from their normal distribution channel, but in the meantime send an email to NHTSA's Marietta Bowen: Marietta.Bowen@nhtsa.gov or call her at 202-366-4969. The price is right! A study released by researchers at the University of Pennsylvania indicates that repeated concussions can produce changes in the brain that are predecessors of Alzheimer's disease. The study used laboratory mice, not humans, but documented the development of deposits of a plaque-like protein found in the brains of Alzheimer's patients. The concussive blows were equivalent to what a boxer or football player might sustain. The researchers believe the experiment establishes a link between repeated concussions and Alzheimer's. An earlier study of WWII veterans reached similar conclusions in 2000. Thanks for the opportunity to make a almost unknown hazard known. A 5 year old (my grand daughter) got off her bike to play on some play ground equipment with her helmet still on. She tried to slip through some bars which were plenty big enough for her had she not been wearing a helmet. The helmet got caught and she literally "hung" herself. She was unconscious in a few seconds. Fortunately, I was able to save her. I believe this potential hazard should be made known by a sticker on every helmet sold. CPSC has issued a recommendation that users of motorized scooters use standard bicycle helmets for protection. The recommendation probably came as a surprise to many manufacturers of the helmets, who often have warnings on their products that the helmet is not for use with motorized vehicles. CPSC also updated their statistics on scooter injuries, still very low in number by comparison with bicyclist injuries although possibly high on a per-mile-traveled basis. You can read the CPSC press release for details. We don't see as many scooters on the streets now. World Industries and CPSC have announced a recall of skateboard helmets that did not meet the impact requirements of the CPSC standard. The helmets were labeled with the World Industries brand, and would have been legal for sale in the US as skateboard helmets, since skateboard helmets do not legally have to meet any standard here. But World Industries had labeled them as meeting the CPSC bicycle helmet standard, and CPSC testing revealed that they did not meet the impact requirements. You can read the CPSC press release for further details. New York Times publishes article on helmets. The Sunday New York Times had an article on its front page by Julian E. Barnes on helmets. We will be dealing with its myths for years. The article is headlined "A Bicycling Mystery: Head Injuries Piling Up." Its theme is that head injuries per active cyclist have increased 51 per cent in the US despite increased helmet use and less bicycle use. The tone is that helmets should have prevented this if they were as effective as advocates claim they are. If you are willing to sign up for their Web site access you can read it on the Times Web page. They will not permit us to post it here. We have posted a review of the article. It is not unusual to be disappointed with newspaper articles when you know something about the subject matter. Most helmet videos are not very inspiring. It is a major event when one appears that is really on target and can be very useful for helmet promotion campaigns. The Pierce County (WA) Coalition of the National Safe Kids Campaign (now Safe Kids Worldwide) has just produced the best thing we have seen since Jello in a Jar, some years back. The new video is titled How to Fit a Helmet. It will be most useful for parents or for adults who are being trained as helmet fitters. It should be ok for kids as well. An adult is shown fitting helmets to various kids' heads to illustrate the important points. It shows how to deal with pony tails by moving them lower on the head below the helmet, and suggests that when fitting kids with braided hair the helmet recipient be given extra pads to refit when hair styles change. The video does not attempt to cover rear stabilizers, but in 7 minutes it does a fine job of the basics. Checks should be made payable to Pierce County Safe Kids Coalition. Congratulations to Suzanne for a great script and to the other coalition members for their contributions. Louisiana and North Carolina have both enacted helmet laws. North Carolina's law covers kids under 16 and comes into effect in October. The Louisiana law covers kids under age 12 and comes into effect in March of 2002. The Louisiana law is notable for its language on standards. It provides that helmets manufactured after March, 1999, have to meet the CPSC standard, and those manufactured earlier can meet Snell or ANSI. We would have added ASTM, of course. And deleting ANSI might ensure that some kids had better protection, but these distinctions are all lost in the field anyway. The concept of linking the standard required to the date of manufacture seems particularly useful, even if it complicates the law. The Louisiana law is on the Web as a .pdf file. North Carolina has provided that "all bicycle passengers who weigh less than 40 pounds or are less than 40 inches in height be seated in separate restraining seats; and that no person who is unable to maintain an erect, seated position shall be a passenger in a bicycle restraining seat, and all other bicycle passengers shall be seated on saddle seats." Child tricycles are excluded from the law, but adult tricycles are included and tandems are specifically provided for. Their state-wide field observations showed 17 per cent helmet use overall before the law. A follow-up can actually determine eventually if the law is effective in increasing usage. The Consumer Product Safety Commission has caught three more cases of bicycle helmets being sold in the US that did not meet the CPSC standard. 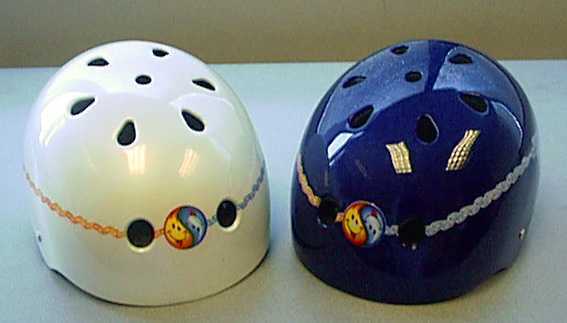 All three were skateboard-style helmets that had been also labeled as complying with the CPSC bicycle helmet standard. The helmets recalled by their manufacturers are the Variflex "X-Games Aggressive", the First Team Sports "Guardian Junior," and three models by NHS, including the "TSG Metallic Gold," "TSG Gloss Black" and "TSG Foundation Blue". Only the Variflex was sold in large quantities. CPSC says they had been tipped off by Good Housekeeping and by a competing manufacturer. We would have emphasized that the recalled helmets were all skateboard-style helmets, not the usual bike helmet style. We have further details in our email newsletter issue on this recall. A study published in the October 28 issue of the British Medical Journal examined emergency room data in the UK over a five year period and concluded that increased use of helmets has cut the percentage of riders with serious head injuries. The study was conducted by Adrian Cook and Aziz Shiekh, and you can read it on the Medical Journal's Web page. The percentage of riders admitted primarily for a head injury dropped from 3393 in 1991 to 2571 in 1995, a percentage drop from 40 per cent to 28 per cent. Although the study attributes the change to increases in helmet use, it presents no evidence of the increase, and there are often multiple factors involved when injury patterns change. Since the data are five years old, the most interesting thing about the publication of the study may be the reaction in the UK, where some critics hold that helmet use is not beneficial, and the British Medical Association opposes helmet laws because compulsory helmets may on balance reduce public health by reducing healthy cycling more than they save heads. The same issue of the BMJ has a fine editorial by Seattle Drs. Thompson, Rivara, and Thompson titled "Bicycle helmets: it's time to use them" that adds further provocation from this side of the Atlantic. A study published in the October issue of the journal Neurology by the American Academy of Neurology showed a much higher incidence of Alzheimer's disease (AD) and other dementias late in life among WW II veterans who had suffered head injuries during their military service. Although similar results have emerged in other studies, this one took advantage of military records rather than relying on patient recall, increasing accuracy. The increased risk varied with the severity of the injury, rising to four times normal in those who had suffered severe injuries. The study results for mild head injury were "inconclusive." The risk of dementia increased even when a head injury was sustained 40 to 50 years earlier. The authors conclude "The veterans in this study sustained head injuries in early adult life. Their risk of dementia 50 years later suggests that pathogenesis of the degenerative dementias may trace to origins decades before the appearance of clinical symptoms. This result is consistent with the perspective that AD is a chronic disease that unfolds over many decades, with an extended latent phase as well as a prodromal stage (progressive "age-related cognitive decline") and the stage of fully expressed dementia." The authors reportedly have added in press interviews the caution that the wartime injuries studied may not be typical of injuries sustained in a bicycle crash. This study still has implications for any participant in an activity where head injury is a problem. The study is titled Documented head injury in early adulthood and risk of Alzheimer's disease and other dementias. It is by Plassman, et. al. They charge a fee to access it. "These bicycle helmets fail impact testing and labeling required under CPSC's Safety Standard for Bicycle Helmets, violating the Consumer Product Safety Act. Riders wearing these helmets are not properly protected from falls, and could suffer severe head injuries. CPSC and Rand International are not aware of any injuries or incidents involving these products. This recall is being conducted to prevent the possibility of injuries and incidents. Consumers should stop wearing these bicycle helmets immediately, and return them to Rand International for a free replacement helmet. For more information, contact Rand International at (800) 338-7677 between 9 a.m. and 5 p.m. ET Monday through Friday, or write to Rand International, Attention: Customer Service Dept., 51 Executive Blvd., Farmingdale, NY 14735-4718." There is a photo of the helmet on the CPSC Web page. "These helmets fail impact testing and labeling required under CPSC's Safety Standard for Bicycle Helmets, violating the Consumer Product Safety Act. Riders wearing these helmets are not adequately protected from falls, and could suffer severe head injuries or death. CPSC and Cycle Express are not aware of any injuries or incidents involving these helmets. This recall is being conducted to prevent the possibility of injuries...For more information, call Cycle Express toll-free at (877) 714-6117 between 9 a.m. and 5 p.m. ET Monday through Friday, or write to Cycle Express Inc., 312 Fifth Ave., 5th Floor, New York, NY 10001." There is a photo of the helmet on the CPSC Web page. These two recalls should not obscure the fact that millions of low-cost helmets are being sold here in discount stores that are at least as safe as the helmet Lance Armstrong is wearing in the Tour de France. In some cases the discount helmets may actually offer better impact protection at the speeds most people crash, since the inexpensive construction techniques do not allow the design excesses of more expensive helmets. Lance may need jillions of vents, but most riders are cool with a lot fewer, providing a larger area of protective foam, and a rounder, smoother, safer shape. The medical journal Pediatrics reports that the town of Wadley, Georgia, has set up a police program to seize the bicycles of riders under 16 who are not wearing helmets. Parents and kids then come to the station house to retrieve the bicycle, and are treated to a lecture on helmet safety. For a second offense the bicycle would be permanently confiscated, but there have been no second offenses to date. The State of Hawaii enacted a helmet law on June 20, 2000, that will take effect on January 1, 2001. It covers riders under 16, and passengers in bicycle seats or in bicycle trailers. It requires a "properly fitted and fastened bicycle helmet that has been tested by a nationally recognized agency such as the National Highway Traffic Safety Administration, the National Safety Council, or the Children's Safety Network and is designed to fit the user and protect against head trauma." If you followed the strictest letter of that law, there is no helmet on the market that actually meets those criteria, since as far as we know none of the named organizations has ever tested any bicycle helmets, but the legislative intent will surely be interpreted to encompass a helmet that meets the CPSC standard. Renters are forbidden to rent a bike to anyone under 16 unless they have a helmet. The maximum fine is $25, and parents are liable for it. This is the first new state law in some time, and shows that efforts to pass them continue. Hawaii is the 17th state to pass a bicycle helmet law. For a complete listing, see our mandatory helmet law page. AP reports that the Tennessee legislature considered and rejected a change in the state's 1994 helmet law that would have extended coverage from state-maintained roads to all roads and sidewalks in Tennessee. The bill would also have increased the age covered from 12 to 16. The Consumer Product Safety Commission will hold a public forum on May 2nd on the subject of repetitive impact head injury. This is a subject being discussed extensively in the soccer community at present, where the question of use of protective headgear for soccer players has arisen following publication of study data indicating that long-term soccer players may suffer brain injury from repeatedly heading the ball. We have some info on soccer helmets up on our page covering helmets for various activities other than bicycling. Gina Galant of Prince George, B.C., Canada has designed a new helmet with a novel and potentially useful innovation: it uses LED's to inform the wearer when it is fitted correctly. We believe that the concept of a helmet that gives active feedback on the accuracy of its fit is worth pursuing. Ms. Galant also hopes to instill in wearers an instinctive sense of what a well-fitted helmet feels like, encouraging them to adjust future helmets to achieve a similar good fit. We have a page up with her explanation of the concept. The City of Oakwood, Ohio, has passed a Resolution directing its Public Safety department (Police) to use education and encouragement to promote helmet use among younger cyclists. Oakwood decided not to pass a town ordinance on helmets, but instead direct its police to conduct an education campaign and eventually begin "waving over" cyclists who are not wearing helmets to caution them and then invite them to an education program session at police headquarters. No fines or other deterrents are permissible as this is not an ordinance. The resolution is an innovative way to approach the question of promoting helmet use through local police. You can read a copy of the resolution here. Here are the Briefs from prior years.